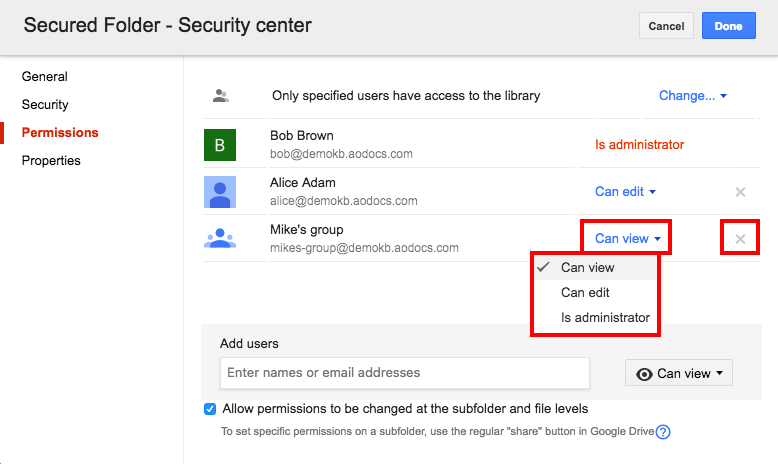 As a library administrator, you can access the Secured Folder security center directly from Google Drive. 1. Open a Secured Folder library as a library administrator. Name: Rename your Secured Folder. Note: Don't use the Rename button in Google Drive to rename your Secured Foder, as AODocs does not recognize it. 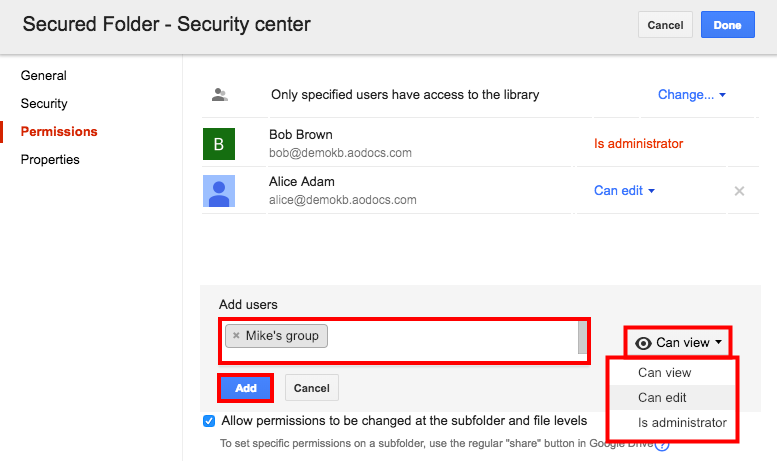 Push the Secured Folder to the Google Drive of users with access to it. Send the users an email notification indicating that a new Secured Folder has been added to their My Drive. Trash retention: Manage the library trash retention period by selecting to never delete the trash or automatically delete trashed files after 30 days. 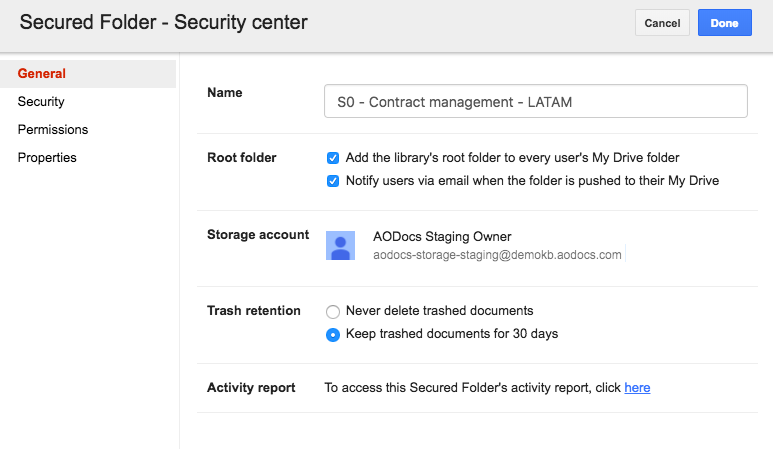 Activity report: Access the Secured Folder’s activity report in the AODocs interface. if you select the checkbox, only administrators are authorized to modify the sharing permissions of files and folders in the Secured Folder. if you don't select the checkbox, all users in the Secured Folder with edit permissions are authorized to modify the sharing permissions of files and folders. Note: In Secured Folders, administrators can prevent users from deleting, renaming or creating files and folders at the root folder level. Learn more: Manage folder properties in Secured Folders. 1. Enter the email address of the new user or Google group in the input field. Note: AODocs autocompletes email addresses available in your G Suite domain global address list. 3. Press Add to add the user/group to the list of people authorized to access the Secured Folder. 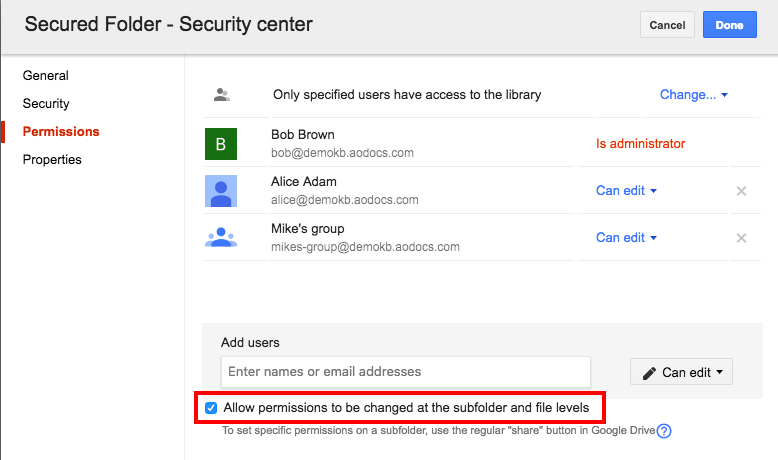 For existing users or groups, you can change their permission level or remove them from the Secured Folder. 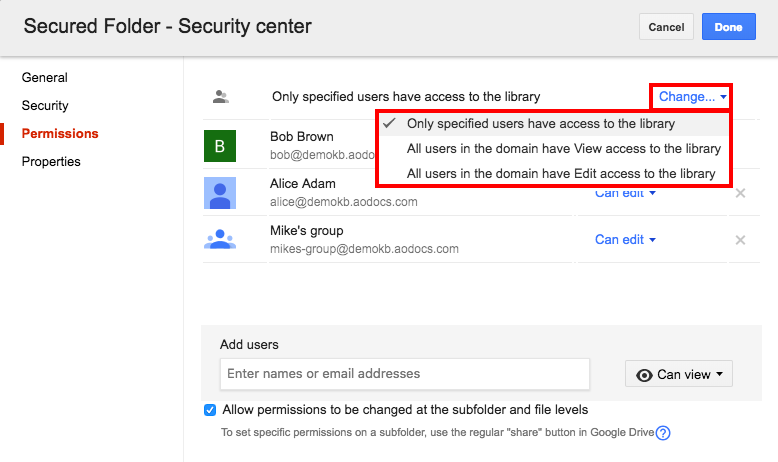 Note: The highest level of sharing outside your domain set in the G Suite Administration console overrides the visibility options set at the library level. Flexible permissions: the checkbox is selected. 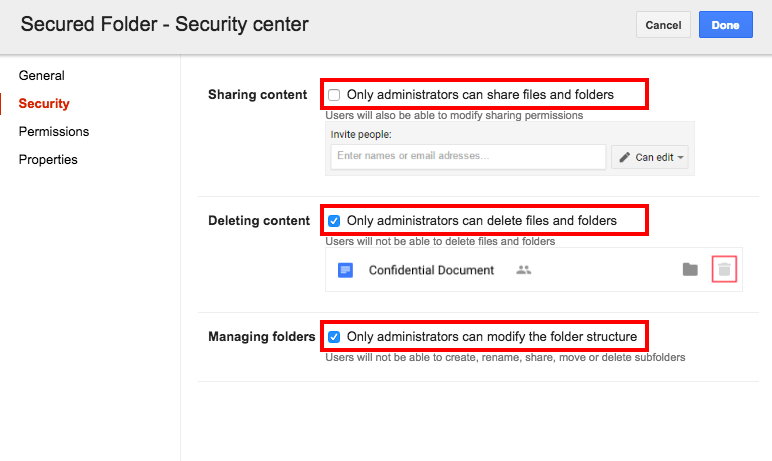 Users with sharing privileges can manage permissions at the level of subfolders and on individual files. 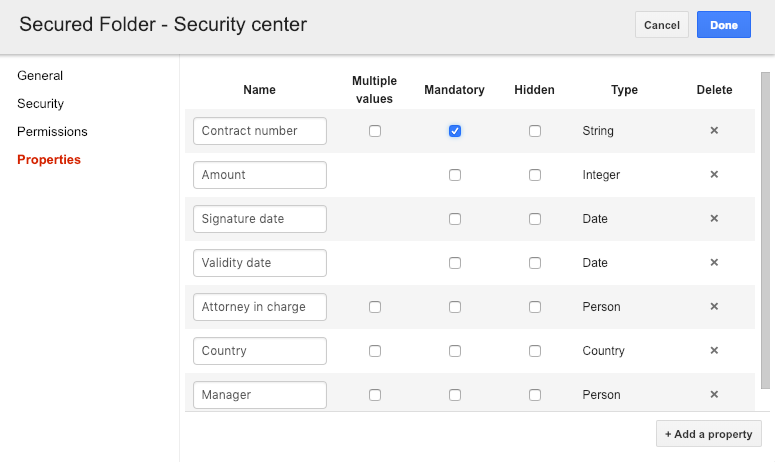 Uniform permissions: the checkbox is not selected. Files take the permissions set at the library level and cannot be changed at the level of subfolders or on individual files. Properties (or metadata) provide information for a specific file. Properties can be used to structure documents, to improve the search experience or to customize a workflow. As a library administrator, you can add, edit or remove AODocs properties from a document class directly from Google Drive. Learn more: Configure document class properties from Google Drive.